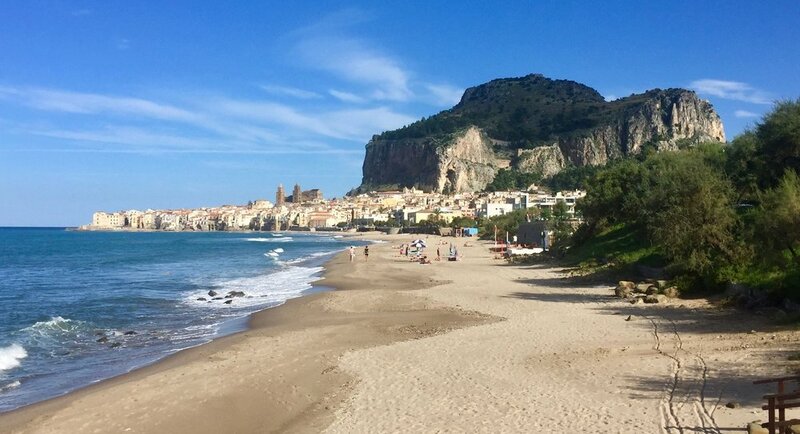 The Euro Travel Coach Team got to explore Sicily for the first time in October and it was absolutely amazing. We enjoyed every minute of our food and wine tour in southern Italy. The island is magical, even when the weather is uncooperative and the steep, curvy roads are marked as closed, even though they are not. In addition to wine tasting in this part of Italy and feasting on fresh seafood and delicate pastries, our southern Italy itinerary also included unbelievable Greek ruins and a beach or two. Keep reading to discover favorite meals and moments and some insider tips and favorite spots we uncovered along the way. Sicily is one big island! It is incredible how big Sicily is. I had no idea how long it would take to get around the island. When you look at a map of Italy and see Sicily poised just off the toe of the boot, it just doesn’t seem that big. But in making a circular loop around the perimeter, you quickly discover that you are covering a lot of ground! Not only that, the roads are narrow, the traffic is crazy and getting from A to B takes a lot longer than you think. That is all part of the charm of this enchanting island. 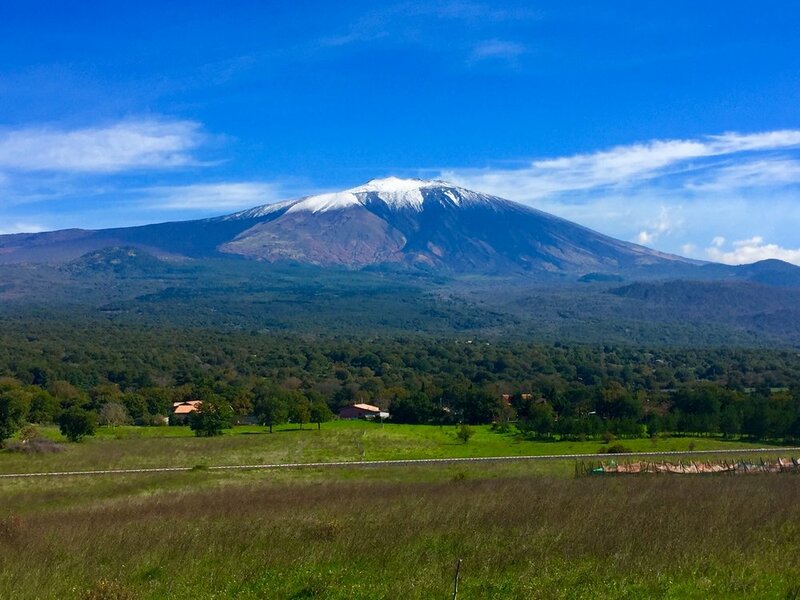 Mount Etna before the recent eruptions! We landed in Catania and could see Mount Etna from the runway. It is an imposing site on a clear day, especially with snow at the top. We got to hike up Mt. Etna with our skilled guide, Davide Federico with Mount Etna Tours. He was amazing. It’s a challenging climb.! The broken lava pebbles are slippery as you work to gain elevation; but the reward is incredible! We drove about 2/3 of the way up the volcano and parked at a “refuge” before beginning our hike. Davide taught us about volcanoes and Etna and Sicily as we drove and then he led us up this incredible mountain. We hiked for about 2 hours before entering Davide’s “living room” where we ate delicious sandwiches while gazing beyond the lava valley toward the top of Mother Etna, who actually spoke to us! The rumbling sounded like thunder, but different. The sound was actually from explosions deep inside the earth. The volcano was smoking at the top and Davide told us that because it was grey, it wasn’t steam….it was ash from these explosions. It was incredible and Davide was awesome. He is an amazing guide! We had so, so many unbelievable meals during the two weeks we were in Sicily. It would be easier to list the select few meals that were not amazing than to share the long list of those that were. 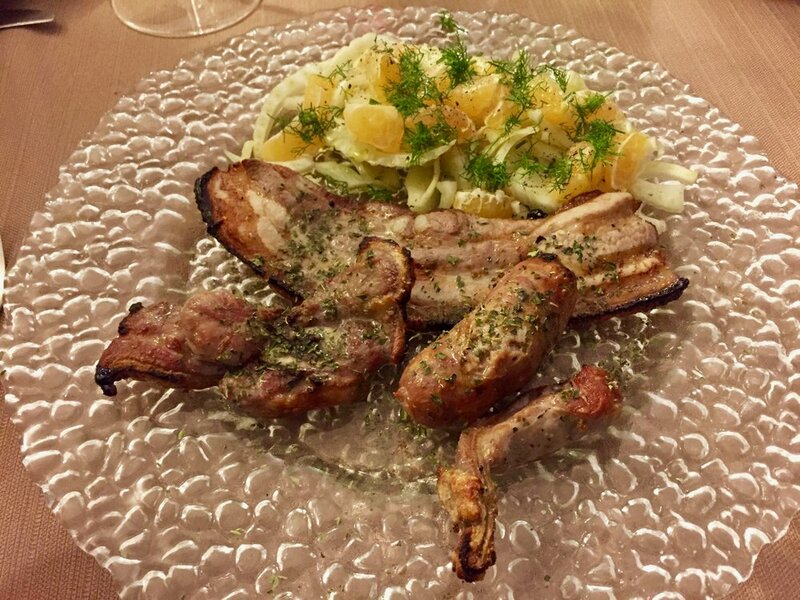 Let me share a few particularly remarkable meals to just give you a taste of the delights that Sicily holds for those who love fresh, delicious, local food. Cave Ox is a pizza bar where winemakers go at the end of their day. It was inexpensive, delicious, and had a great wine cave where we were taken to choose our wine. We got SRC natural wine based on the owner’s recommendation and it was delicious. There were four of us for dinner and we enjoyed spectacular gnocchi, tagliatelle with local Etna greens and herbs and a mixed grill with a salad including fennel and oranges – we also got ice cream and tiramisu for dessert – it was all delicious. The total bill for all 4 of us including wine was €109. Fantastic! Terra Mia in Castiglione di Sicilia was terrific! This place was recommended by our host at our tasting at Girolamo Russo and of course, Chelsea had read about this place as well. Her restaurant research is always spot on! We had Nebrodi black pig prosciutto and smoked melted cheese with honey that was absolutely delicious. 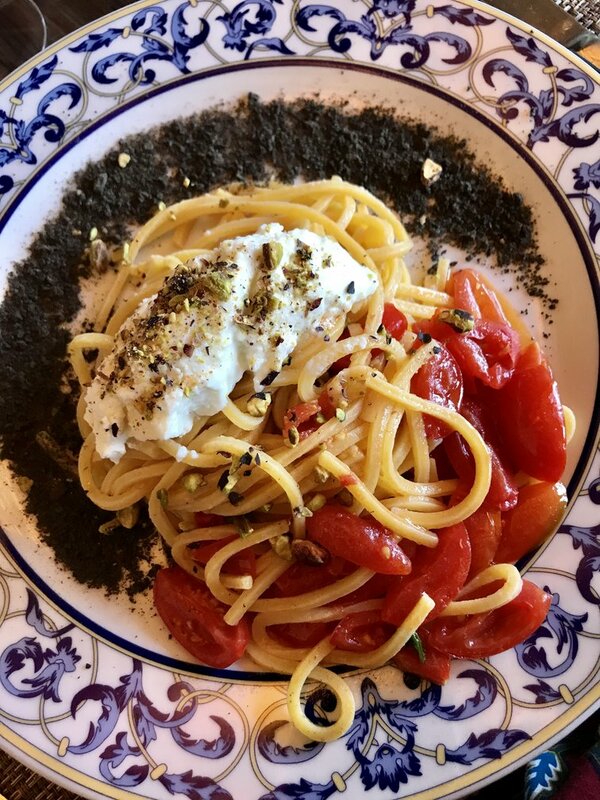 We also had 4 different pastas – one was in the form of Mount Etna with ricotta cheese for smoke, red tomatoes for lava, and bread crumbs with squid ink for the black ash. It was so cool! In Erice, we enjoyed a great dinner at Monte San Giuliano. It was recommended by Massimo who was our wonderful host at our darling Airbnb, Erice Pietre Antiche. We were the only customers in the restaurant for most of the evening. A table of 3 men were there when we arrived, but left soon afterward; and a couple arrived when we were nearly done. We had the best grilled octopus we have enjoyed since we were on Santorini in 2014. Then we had sea bass baked in salt, fish couscous, and my favorite – Busiate pasta with garlic and tomatoes and other deliciousness – it’s a local dish and it is amazing. We had dinner at Scjabaca in Palermo and it was fantastic! Wandering around the narrow cobblestone streets of the city, we saw this petit restaurant tucked around a corner. Greg looked it up when we got back to our hotel and it sounded good so we made a reservation. We had grilled octopus, and a dish called Opposites with tuna and chorizo for appetizers – these were delicious! Then we had pasta with sardines, risotto with porcini mushrooms and guinea fowl. Our wine was a nero d’avola by Cristo di Campobello. Everything was terrific! This is such a tiny, cute restaurant with stone walls and just a few tables. They are Slow Food oriented and only 3 months old. We were impressed! We love wine tasting in Italy, so our southern Italy itinerary included lots of visits to some great Sicilian wineries. We enjoyed an amazing tasting at Franchetti winery on the northern side of Etna. It was a fascinating experience because the region is so different from other places we have toured. The grapes are different, the soils are volcanic, and therefore, the wine is unique and special in a whole new way. This was an interesting introduction to Etna wines for us, by a great producer who also makes wonderful wine in Tuscany. We’ll have to go there too! We still had energy after our tasting at Franchetti so we decided to go to an enoteca in Randazzo called Il Buongustaio d’Etna and it turned out to be fantastic! We tried a rosé and a red by Frank Cornelissen, who is a natural wine producer. It was terrific! Our broken Italian got us what we wanted and it was fun to order. The owner opened 2 bottles of his wine and set it down in front of us so we could taste them both. He just left them there and let us pour as we wanted, and he charged us at the end. Our wines were served with a beautiful and generous meat and cheese board. We enjoyed our wine and the charcuterie all for about €10 each. We love Sicily! 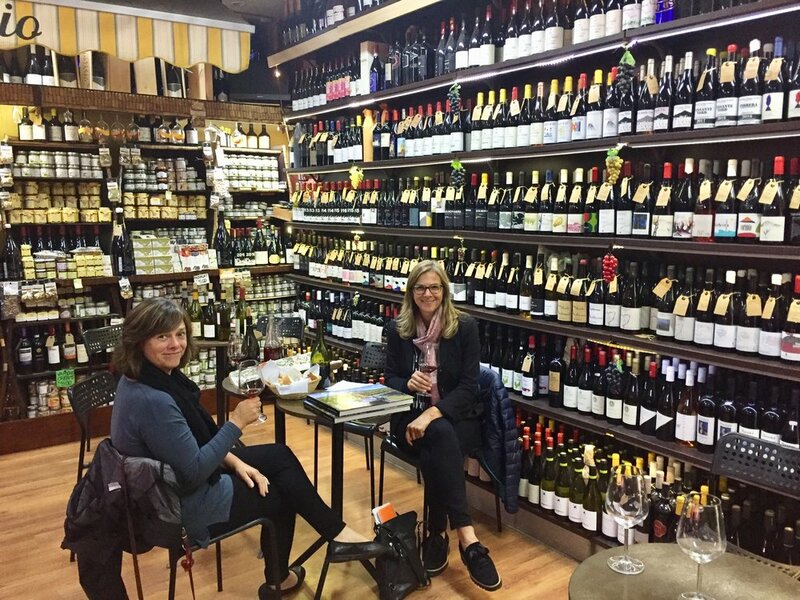 It’s a tough choice, but our favorite tasting was probably at Girolamo Russo. This winery is again on the northern side of Etna, in Passopisciaro. We met our host, Dante, who was absolutely charming. He showed us the fermentation process going on – in open plastic containers. He dug his hands right into the fermenting grapes. It was so cool. Then he took all of us out to the vineyard in his tiny car and showed us the vines. It’s a beautiful place – with a gorgeous view out over the Sicilian countryside. We tasted their wines on an enormous round table built from the top of a big barrel made out of chestnut wood. He served us olives along with their beautiful wines. I noticed a jar of homemade peppers made with anchovies sitting on the counter and I was intrigued. When I mentioned it, he just gave us the ½ filled jar! This was such a personal experience and was so very cool. Our tasting at Occhipinti was fantastic!! Vittorio showed us the cement fermentation tanks and barrels. Arianna Occhipinti makes all natural wines and she makes them extremely well, using frapatto and nero d’avola grapes for the red wines. She also has excellent whites. Our tasting was wonderful, even though it was a grey rainy day. Occhipinti winery is closely connected to Baglio Occhipinti, a beautiful farm resort managed by Fausta Occhipinti, Arianna’s sister. This family is gifted in wine making and hospitality and the winery and the resort collaborate a great deal to make truly remarkable experiences for their guests. We visited Baglio Occhipinti in order to consider bringing a group there in the future. I’m so glad we did! It’s absolutely gorgeous – I think it could be a great place for us to bring one of our small group tours. We currently offer a small group trip to Tuscany and a small group trip to Piedmont. Both are terrific itineraries and we have SUCH a great time with our guests. We want to expand our offerings to include Sicily in the future and this would be a wonderful place for us to stay. We got to meet Fausta when we were there and she is truly charming. She’d be such a lovely host for us! Sicily offers some of the best wine tours in Italy. An interesting aspect of a wine tasting holiday in this part of Italy is that still wine is not the only product made from all those grapes. We enjoyed a wonderful Marsala tasting at Florio. We stopped at a pasticceria on the way for a bite of breakfast. It was on the road, on the way into Marsala, and it was bumping! We also saw some salt flats on the drive and they were so cool. We will tour the salt flats the next time we come to visit Sicily – it was too rainy this time, but we’ll be back. Our tasting at Florio was really interesting. Marsala fortified wine is different than still wine, of course – the process of making it is different, so it was really fun to learn about it. They store 600 million liters of wine there – the place is massive….and historical. Very interesting. And we really liked the marsala wine! There’s so much more to share about our time in Sicily! I’ll share that in our next blog post so stay tuned and I’ll let you know about our hikes, special treats including cannoli, chocolate and gelato, Greek temples, Greg changing a flat tire in the narrow streets of Noto, and more. Are you planning a trip somewhere in Europe? We can help with that! Remember that we are always available to you and your friends and family for custom trip planning to Italy, France, Ireland, England and all of Europe. We also still have spots available on our small group trip to Tuscany in May and our small group trip to Piedmont in October 2019! We'd love for you to join us! You can always reach Betsy at betsy@eurotravelcoach.com. We would love to help you make your travel dreams to Europe come true!